Back in January, I saw that my girl Eboni (yes from Ragnar) was trying to get a team together. 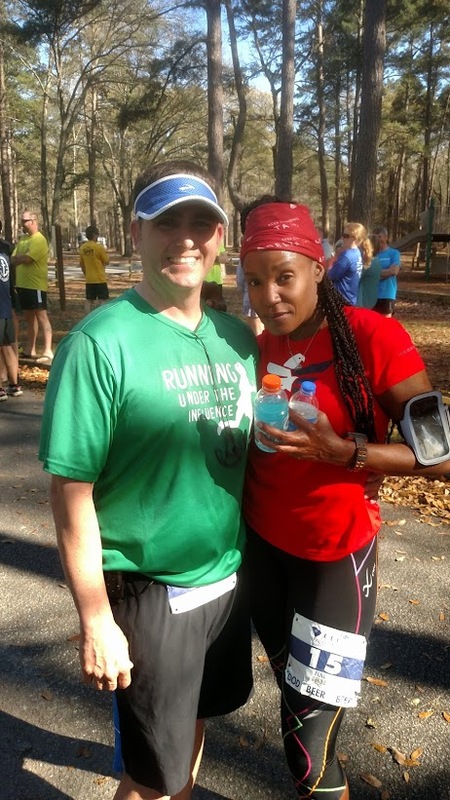 She had six runners (including me) that were committed to signing up and running. So that left me to find the rest of the team. 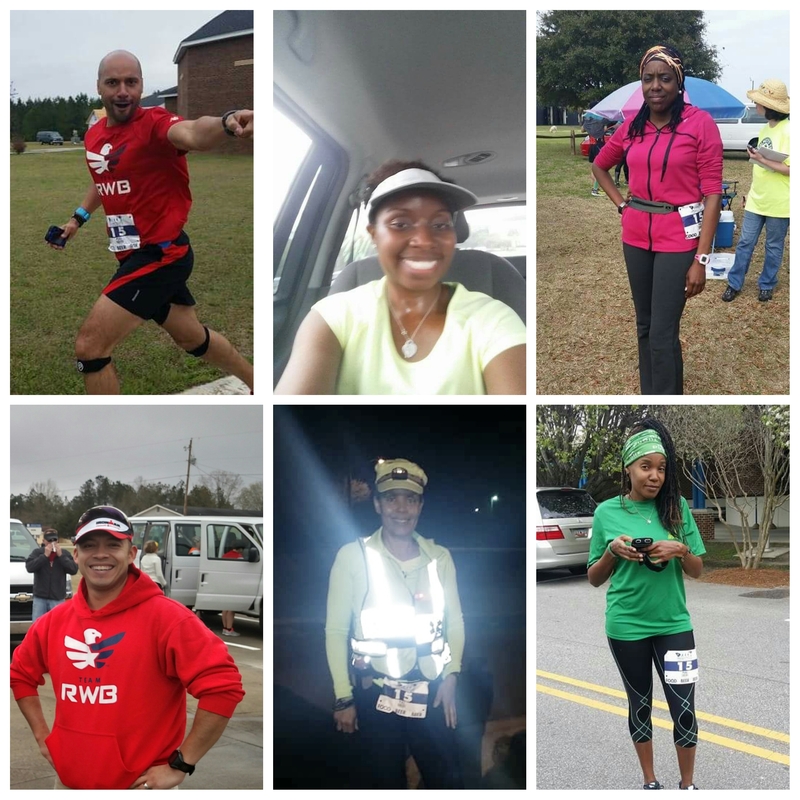 I posted on Team Red, White and Blue (RWB) Columbia and Black Girls Run! (BGR!) Augusta’s Facebook page. What an overwhelming response, within two hours it looked like we might actually have a team. 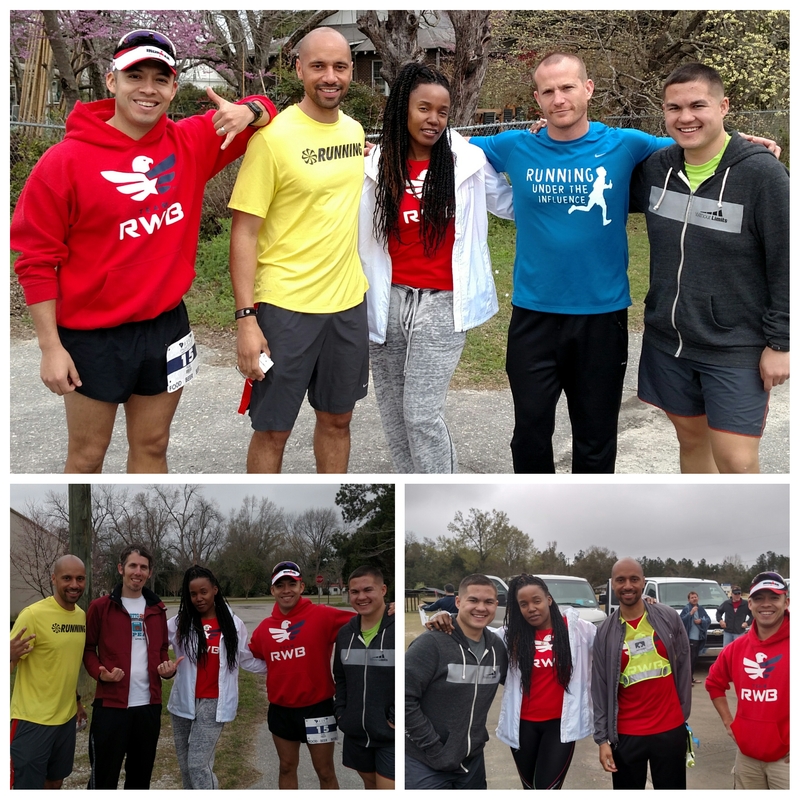 In the end only three of us from Team RWB and two from BGR! actually signed up on the team. Looked like we had a solid team and was ready for the logistics. It’s never that easy. 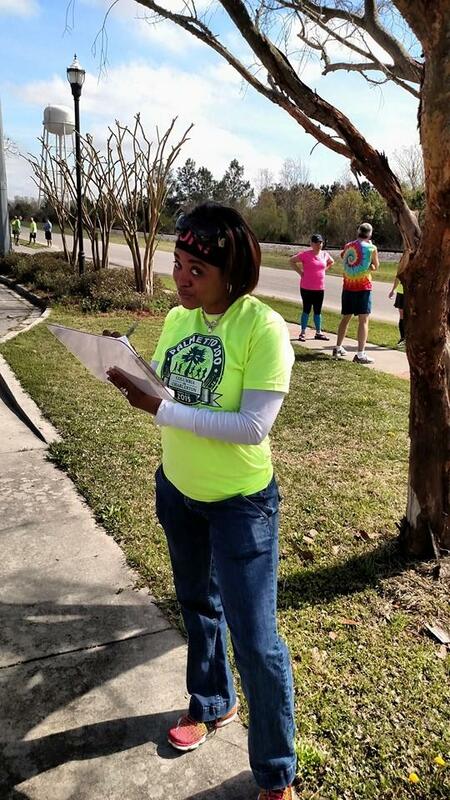 We ended up losing three runners and one volunteer before we could even make it to race day. Thankfully two members from BGR! 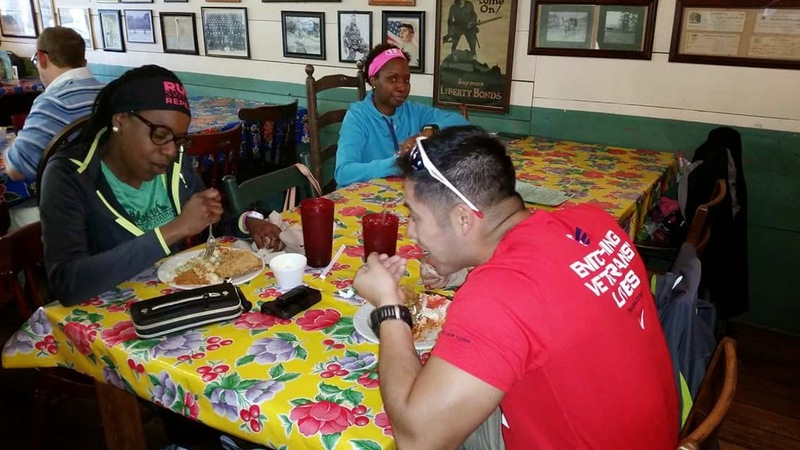 Columbia (Renita and Shawnna) and one member from Team RWB (Mike) stepped in at the last minute (literally two days for Mike). We were team WE RUN SC!. We had two vans, each with six runners and one runner was on the road at all times. Every full team had to complete 3 separate rounds (not sure what the setup was for Ultra teams). 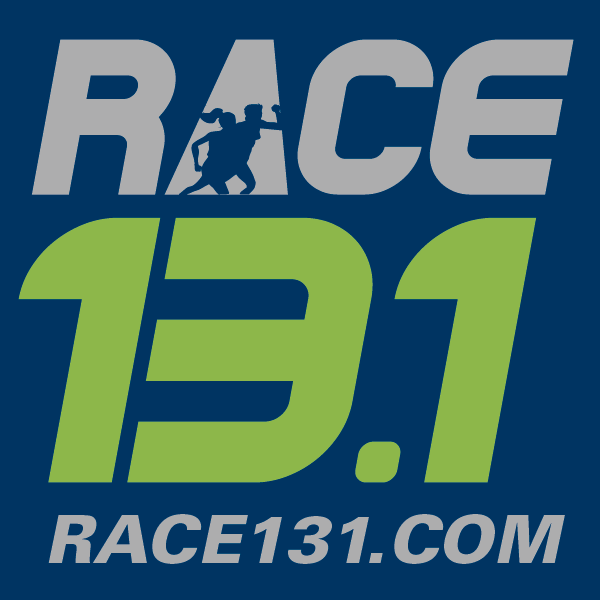 Each runner had three legs with different distances, i.e. 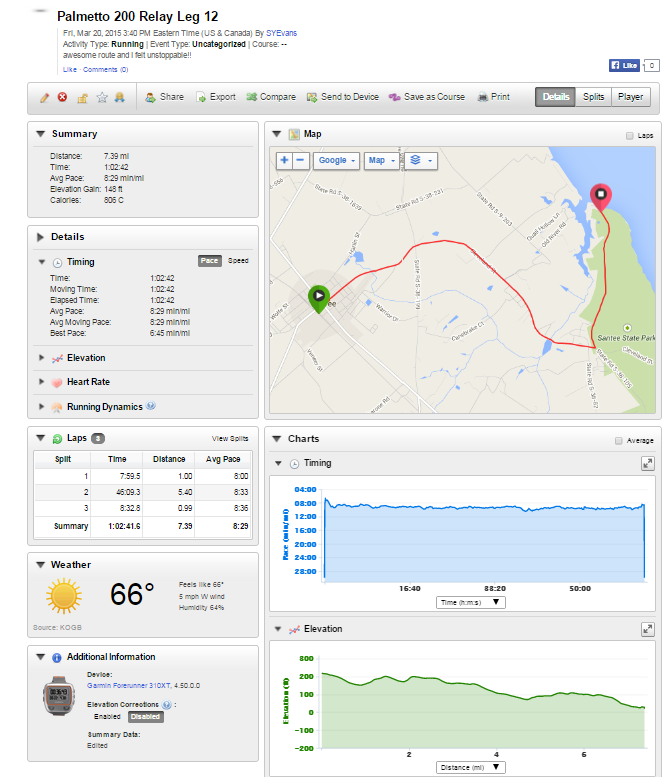 I was the 12th runner and my legs were: 12 (7.9 miles), 24 (8.0 miles) and 36 (8.5 miles). Van one completed the first six legs and Van two finished up the last six legs of each round. At 5:30 AM our team’s first runner crossed the starting line at Coble Plaza. 206.2 miles, 33 hours, 02 minutes (average pace 9’36) later we crossed the finish line together as a team in Charleston, SC!!! Overall this was a very exciting and wonderful experience. If you’re considering signing up for one of these relays (or this one next year), I really recommend it. 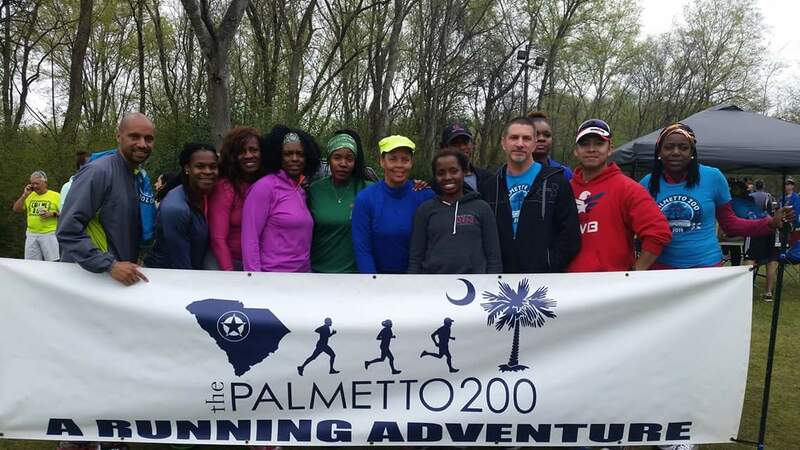 We all had a lot of fun running over 200 miles from Columbia to Charleston. Van one’s start time was 05:30 am. They met up at the designated parking area and headed over to the first exchange, Coble Plaza in Columbia, SC. 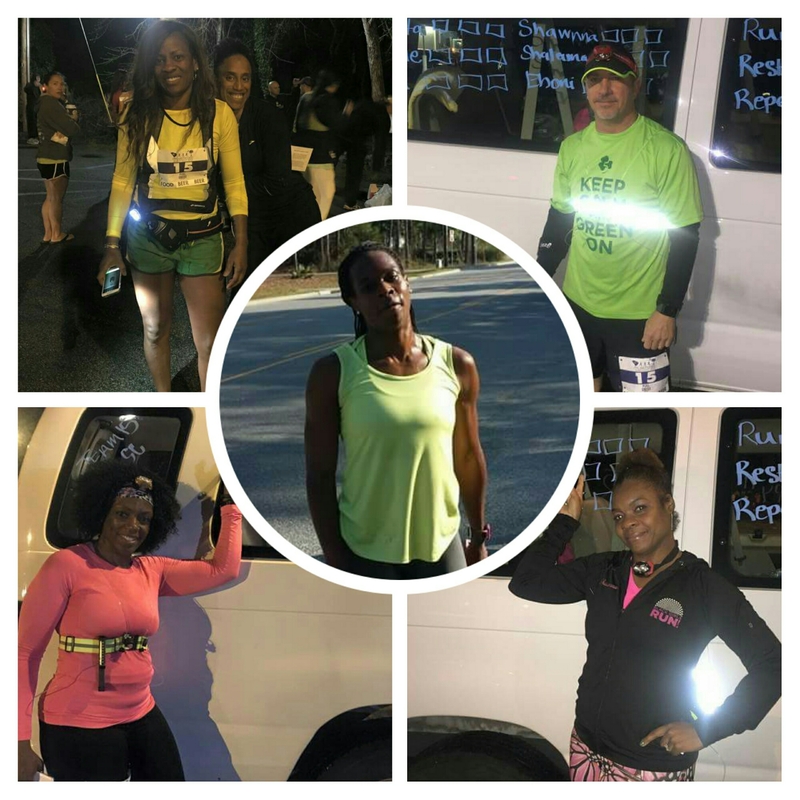 Team members in order of how they ran: Renita, Yvonne, Keith, Shawnna, Shalama and Ebony. Since Van 2 had a later start time, we all agreed to meet at the designated parking area and head over to the seventh exchange to meet the rest of the team. Van 1 did an excellent job with pace and got to us an hour before our original start time. AWESOME. 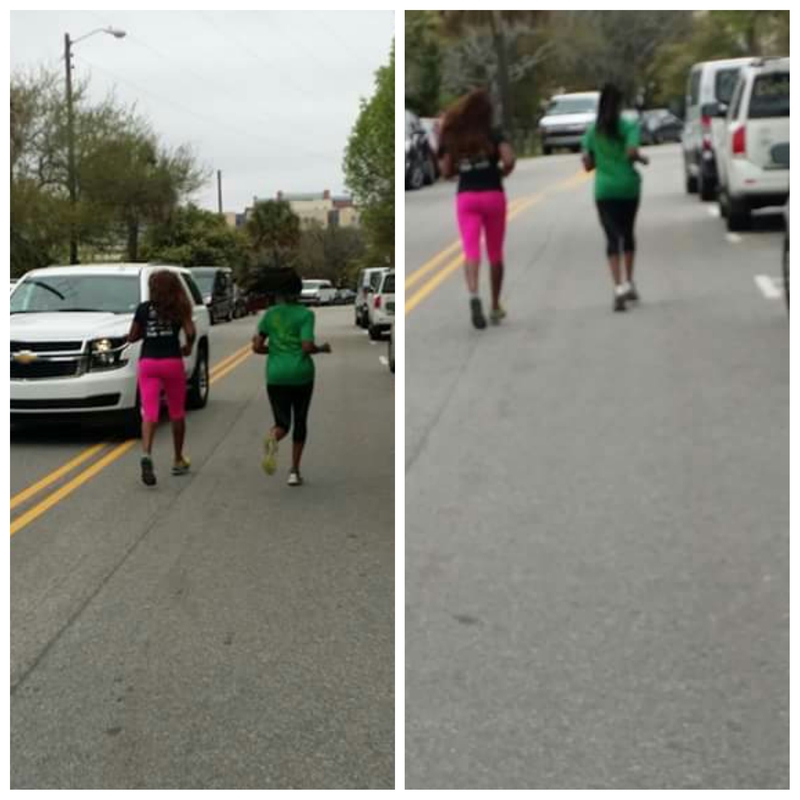 Around 12 pm, it was our turn to run!!! We were able to cheer on Van 1 as they came in and from there our first runner was off! While waiting around for runners at the various exchanges, I had the pleasure of saying hello to my fellow Eagles that were running in the relay. Van 2 time to run!!!! 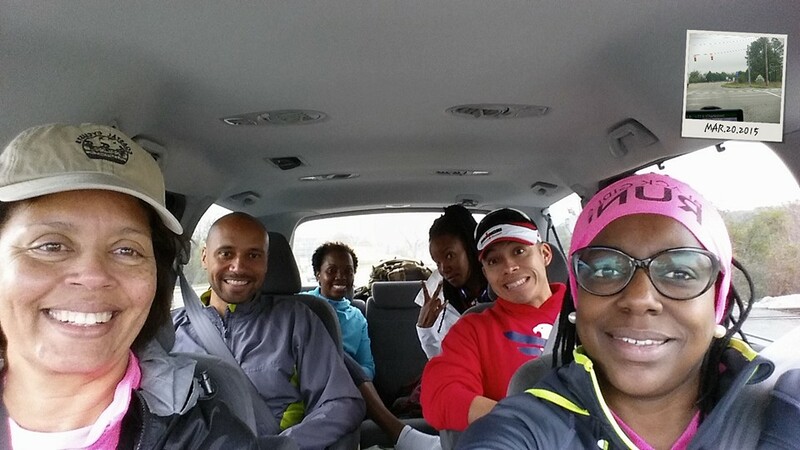 Our van members in the order that we ran: Omar, LaTessia, Deonne, Mike, Annette and SY (me). We were able to provide van support for each runner by driving a few miles ahead and stopping to provide water/Gatorade and plenty of cheers! Here I was starting at 3:40 in the afternoon. I was really looking forward to this run; it was the last leg, so that meant we would have a chance to rest as soon as I was done. We also got a chance to see our very own volunteer, Amber D, at this exchange. The teams were staggered pretty nicely, so as I was running I didn’t see any one ahead of me. 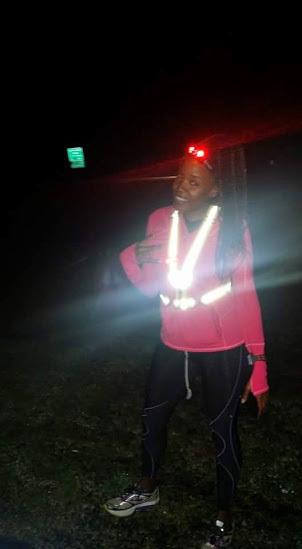 I really thought I was going the wrong way (it happened at Ragnar DC), because I felt as though I should have seen somebody. To my surprise about a mile and a half ahead of me I spotted him. I marked him as my first kill (when you pass another runner)…I was gunning for him 🙂 . Caught up with him, told him good job and kept it moving (even snapped a picture with him at the end of the leg 🙂 ). The team did a really good job with van support. About every couple of miles they would be ready with lots of cheers and plenty of water. I’m so thankful to have a supportive team like they all were (until they were not LOL). Road support from my team!!!! 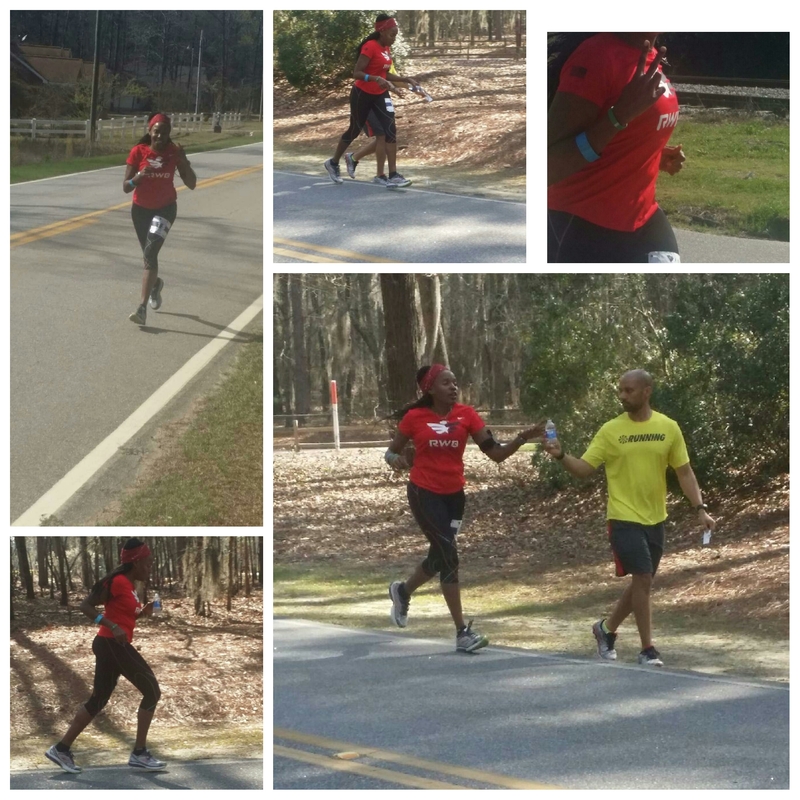 I ran into Santee State Park where I handed the slap bracelet off to Van 1 first runner (Renita). Not a bad run if I do say so myself. I felt really great the whole time. At exchange 13, they had a little BBQ place were lots of runners headed for a nice hot meal, including most of us in Van 2. Since I’m so picky when it comes to food, I didn’t eat. I packed a nice little lunch to eat on the go. My teammates partook in the buffet and let me tell you, the food looked really yummy. As many times as Mike went back for more 🙂 …I’m guessing it was pretty good. We finished with our first six legs around 5:00 pm. We had just covered over 68 miles in about 11.5 hours. Not bad, considering we were an hour ahead of our projected finish time. 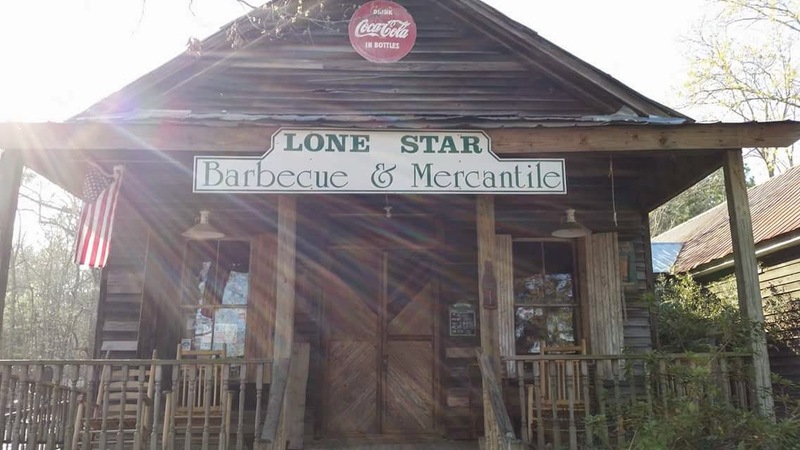 After we ate, we headed to our next major exchange at a church near Eutawville. The church was open and serving food. They even let the runners sleep on the pews. I think I laid down for about an hour (maybe less) to try and get some rest but it was way to loud. Annette and the guys didn’t have any trouble getting to sleep (snoring was a dead giveaway 😉 ). The rest of us headed back to the van to wait until it was our turn to run again. 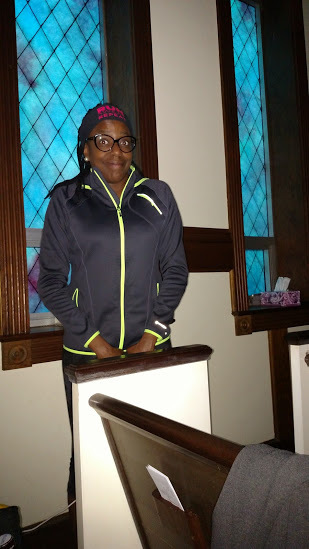 Deonne had enough of all the noise in the church…. We got started up again around 11:00 pm. OMG it was so DARK and SCARY out. I was really going to need the team to shadow me during my ENTIRE run. 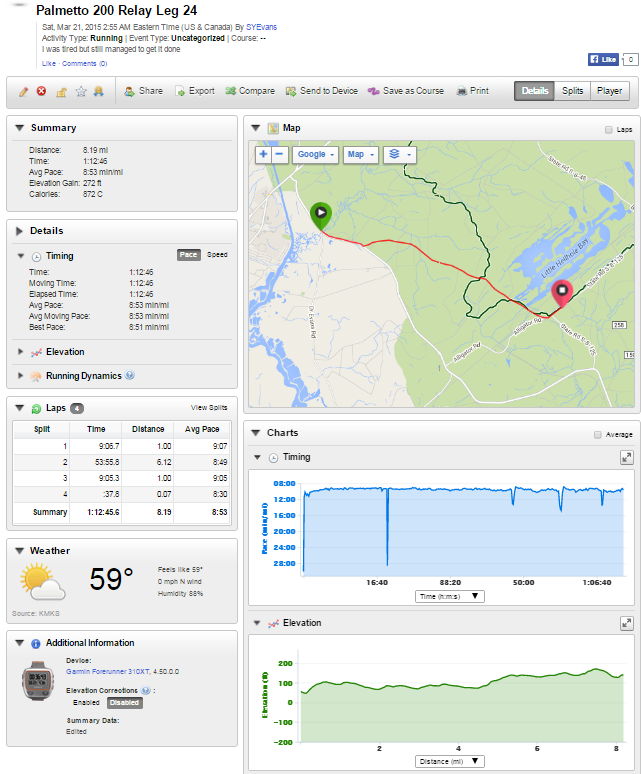 There was nothing peaceful about running down wet back roads in South Carolina. Cars being chased by cops (yeah that really happened), unseen pot holes (almost fell twice), and crazy wildlife noises (okay not sure how wild they were) made for a very interesting run at 0’dark’30. 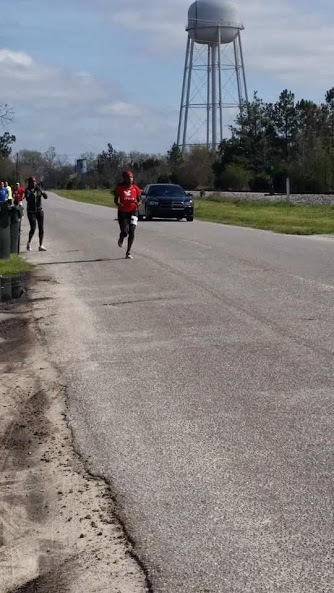 Since I was the last leg to run in my van, my van mates were not that active in cheering me on (yeah I got on to them a little about it LOL). But I was so grateful for Mike driving right along side of me; I was scared as heck. Thanks Mike!!! The route was pretty awesome (would loved to have ran it in the daylight), navigating on the dark roads with the sounds of barking dogs proved to be the only difficult part of the run. The barking caused me to slow up…who am I kidding, I stopped and almost jumped back in the van (twice). I was even at the point where I would have traded out with one of my sleeping van mates (yeah I said SLEEPING…they were knocked out). It was a lonely run (besides Mike and other van’s driving by). I think I finally passed a few runners near the very end of the run. One man came out of no where and passed me right at the end (really out of nowhere). But I prevailed and made it to the exchange to hand off to Renita. I really didn’t think I was going to make my last run. I’m not sure if it was something I ate or lack of eating. I was really sick. I would paint you a lovely picture but someone frowned upon my Instagram pic so I will let it speak for itself 🙂 . I really contemplated not running my last leg. 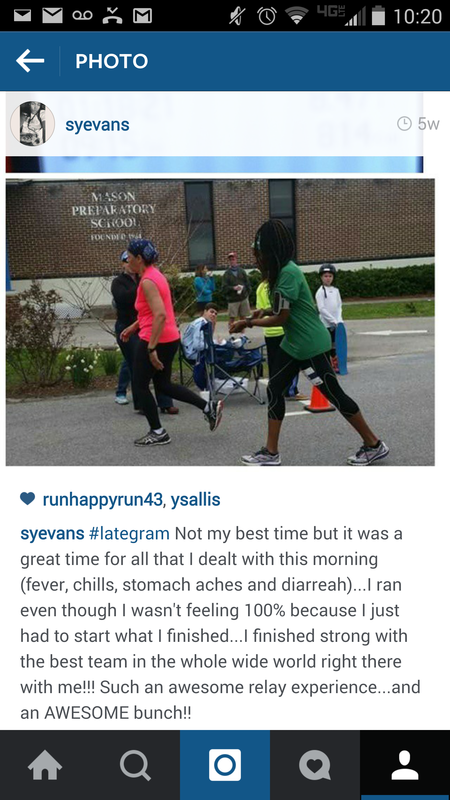 Two of my sole sistahs from van 1, were more than happy to run it for me because I wasn’t feeling well. I just couldn’t give it up, I didn’t want to hurt the team but I wanted to finish what I had started. So I ran. Yvonne was still pumped from running earlier that she ran with me for a few blocks. I’m so glad she did because low and behold we got lost (signage was horribly placed…brought back memories of me getting lost in Ragnar DC on my last leg…was so not a good feeling 😦 ). We stopped to ask a few people how to get to the Battery and once there, I headed out on my own towards Patriots Point. Not a bad run considering I wasn’t feeling my greatest. 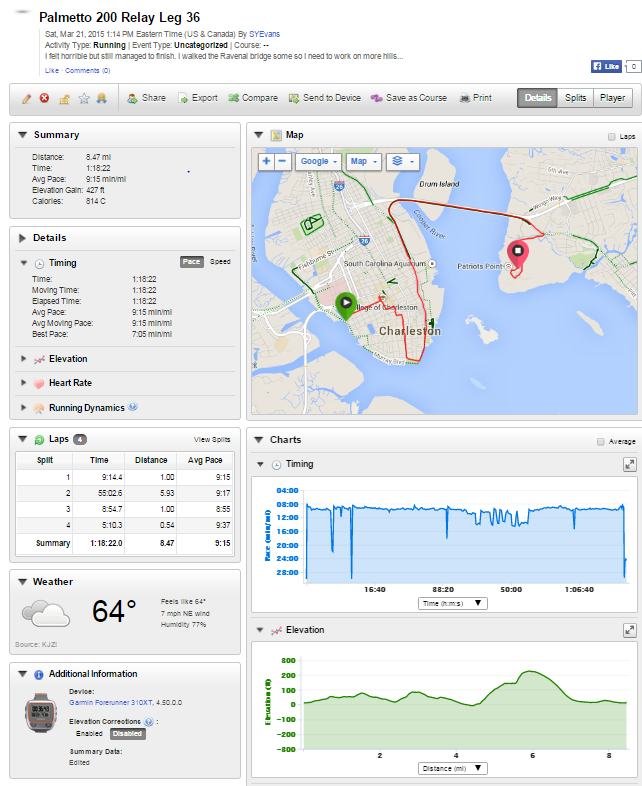 This run took me over the Ravenel Bridge (which many know as the Cooper River Bridge). I’m so glad I ran across this bridge during this race, now I don’t have to sign up for the actual race to say I ran it…WINNING). 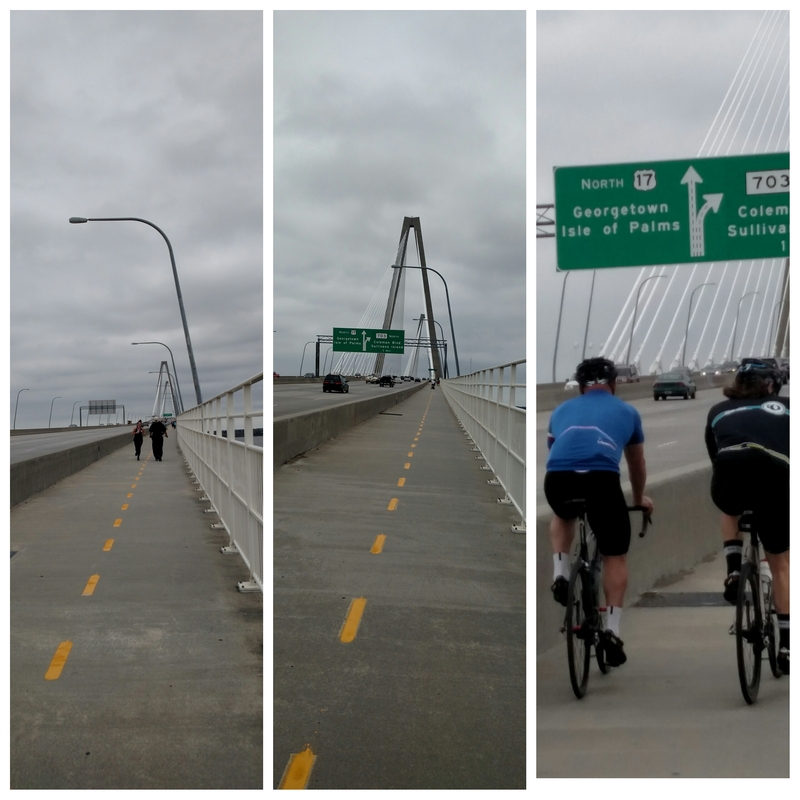 I’m not going to lie…that bridge was tough. It slowed me down a lot, even to the point where I stopped and took a few photos. 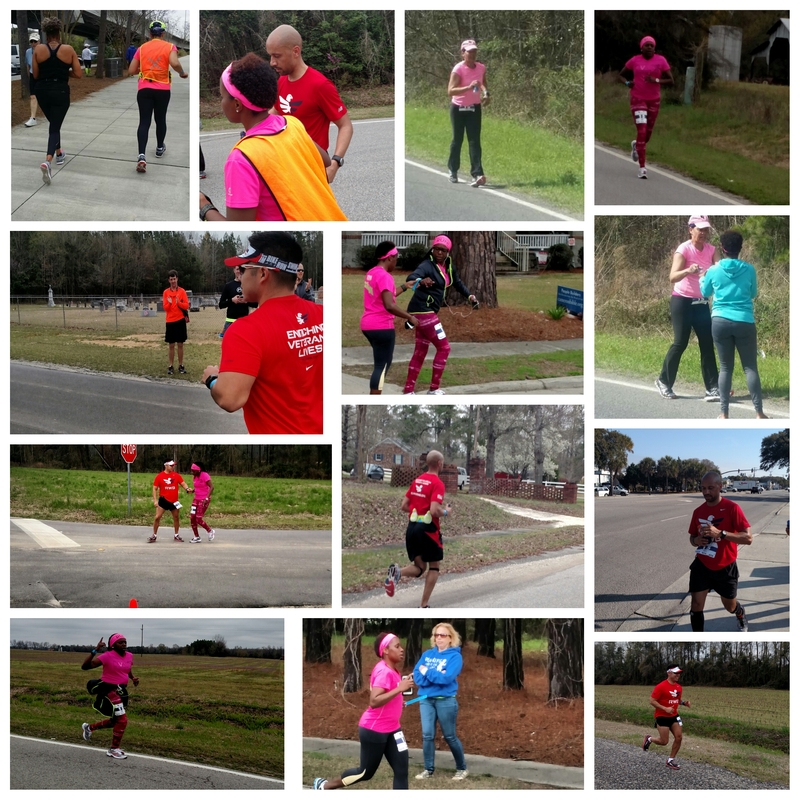 Running through Patriots Point, I soon spotted the entire team and was thinking that I was at the finish…boy was I wrong. I still had a few more feet to run. Somehow, I had enough energy to kick it in gear and high tail it to the finish with my team right behind me. That was the best experience ever!!! By far this was the best relay ever. I’m so looking forward to my next one (yeah I said next one). If you have the opportunity to join a relay team…do it!!! Don’t worry about pace…it’s an overall average. According to our race worksheet, the slowest runner averaged an 11’5 pace and our overall group average was 9’36. So don’t let your pace scare you from joining a team. The goal is to meet new people, run from city to city all while having a good time. And I did just that during this relay. If you have any questions about this experience, please feel free to hit me up. 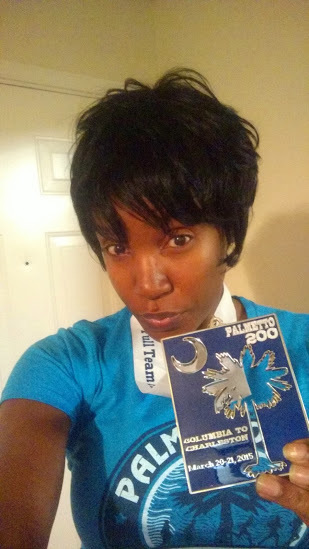 I’m always trying to get a team together for a relay (Ragnar or the Palmetto 200 again) are you down to join my team? BEAUTIFUL !!!!!!!!!!!!!!!!! LUV U SY! !